Now that Apple has sold 160 million iPods, reshaped the music business and inspired dozens of competitors, maybe it's time to admit it: This music player thing might be more than a fad. Yet, in all this time, almost nobody has brought up the screaming flaw that's built into every one of those things: the earbuds. That's right. Hundreds of millions of times a day, music player owners jam those little white discs into their ears without a thought, rendering themselves both deaf and rude to the outside world. And that's if you can even get them to stay in. Nobody talks about it, but a sizeable chunk of the population lacks the proper cartilage formation to hold earbuds in place. Well, technology created these problems, and now it has solved them. Two alternative earbuds neatly solve all of the hearing, safety and fit problems of the traditional disc-style earbuds. Instead of going in your ear, they pass the audio signal directly through your bones or cartilage. They'd be perfect—if they weren't so flawed in their own ways. You can hear the music from your player, but you can also still hear everything around you. These devices also stay put, because no cartilage-wedging is involved. Hooking them over your ears holds the Audio Bones in place. Not everyone has iPod-compatible cartilage pockets, but almost everyone has ears. As a bonus, Audio Bones are less tangly than standard earbuds. Only a single cord emerges, from the centre of the back of the headband—not one per earpiece. They're waterproof, too. The makers of Audio Bones also assert that bone conduction is less likely to contribute to hearing loss over the years, and that this technology permits some people with eardrum damage to enjoy music once again. That's quite a list of virtues. And besides the steep price, there's really only one significant drawback to the Audio Bones—but it's a doozy: The sound quality isn't great. Compared with regular earbuds, the Audio Bones sound muffled, with less presence. They're also much quieter; you have to crank an iPod to its very top volume to hear what's going on. Serious audiophiles who already complain about the iPod's audio quality will be positively aghast. But bone structure isn't the only way to a music lover's heart. A company called Zelco offers an out-of-ear experience all its own: the Outi earbuds ($110). These totally bizarre earphones clip on to the outside of your ear, making them what must be the world's first cartilage-conduction earphones. Finding the sweet spot can take some time; the sound changes a lot depending on where you park them on your ear. They're not especially comfortable either, since they remain in place essentially by chomping down on your flesh. But the weirdest part is the Outis' stealth feature, which becomes apparent only once you start playing music: They vibrate. In an effort to simulate the bone-jarring pulses of a subwoofer in a surround-sound system, Zelco has fitted each earbud with what must be a cousin to the tiny vibrating mechanism in a cellphone. With each drumbeat or guitar pulse, you feel a tiny, audible, vibrating “drrrrrr" on your ears. Yes, you truly feel the music, although the sensation is not so much a bone rattle as it is a rhythmic tickle. The effect is utterly polarizing. Some people think that the vibrations make music listening more interesting. Others can't wait to rip the things off their heads. But look on the bright side: At least some ingenuity is being applied to the problems of in-ear headphones—the most brilliant yet is the Arriva headphones, Arriva.com. 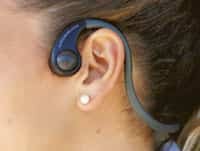 They have a built-in jack for an iPod Shuffle right in the middle of the bendable headband, which goes behind your head. The result: a one-piece, no-wires, non-dislodgeable, easily reachable personal music system. If you have long hair, you can hide the thing completely, which completely changes the experience of attending long staff meetings. But I digress. If you don't mind trading away a little audio volume and clarity for a lot of safety and convenience, then the Audio Bones might have your name on them. 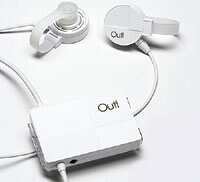 As for the Outis: For the moment, they're best considered an experiment for—here comes the pun—ear-ly adopters.